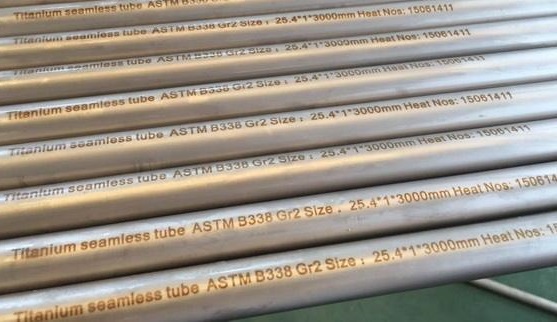 ASTM B338 Grade 2 Titanium Seamless Tubes 1"
Titanium grade 2 seamless tubes, ASTM B338, 25.4 mm(o.d) x 1 mm(w.t) x 3000 mm(l). Recently, we have supplied a batch of grade 2 titanium seamless tubes manufactured to ASTM B338 to a Swedish client for the construction of heat exchangers. The tube size is Φ25.4 mm x 1 mm(wall thickness) x 3 m(length). Heat number: 15061411; Manufacturer: BaoTi.